This show comes with the knowledge that Elvis will be backed by "Good Rockin` Tonight", one of the most popular Rock`n`Roll bands on the circuit today, with the added feature of keyboards and backing singers. 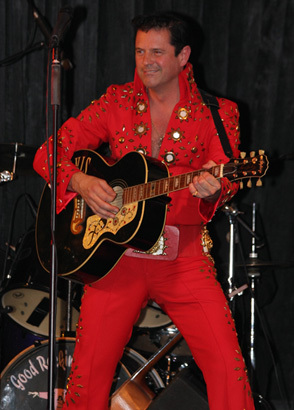 Mark Keeley, starring as Elvis, and his band "Good Rockin` Tonight" are fully professional and relive the early Elvis years with songs such as "All Shook Up", "Blue Suede Shoes", "Don`t Be Cruel", "Teddy Bear", "Treat Me Nice", "Hound Dog", "Jailhouse Rock", this show covers all the hits from the `50`s era. This show also has the feature of Elvis from the `68 TV special displaying the famous "leathers" that he wore. Songs include "It`s Now Or Never", "Stuck On You", "Devil In Disguise", "Rock-a-Hula" and many more. You will also hear all the famous songs from the latter part of Elvis`s life such as "Burning Love", "Suspicious Minds", "Moody Blue", "Way Down", "The Wonder Of You" and of course "An American Trilogy"